Nerdy Birdy likes reading, video games, and reading about video games, which immediately disqualifies him for membership in the cool crowd. One thing is clear: being a nerdy birdy is a lonely lifestyle.When he's at his lowest point, Nerdy Birdy meets a flock just like him. 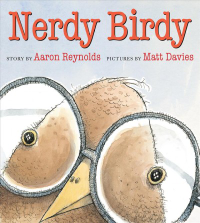 He has friends and discovers that there are far more nerdy birdies than cool birdies in the sky.